Washington, Aug 14 (IANS) America is not the “land of milk and honey” it is often thought to be. Crouching behind pillars to shield from the cold or squeezed at the entrance of shuttered shop fronts with their belongings tucked in a bundle and a receptacle kept for alms, over 600,000 people across US cities are homeless and subsist on the streets or in abandoned areas with some states pushing them into camps and others offering them a one-way ticket back “home”. According to the National Alliance to End Homelessness, there were 633,782 people, or 20 in every 10,000 people, experiencing homelessness on any given night in January 2012, largely unchanged from the year before. 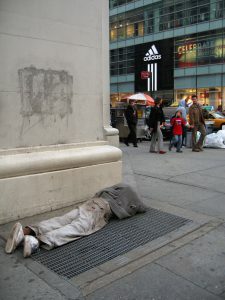 About a quarter of them were children, one-eighth military veterans and some four in 10 disabled unable to work, in the richest nation on the planet, according to its latest report on “The State of Homelessness in America 2013”. 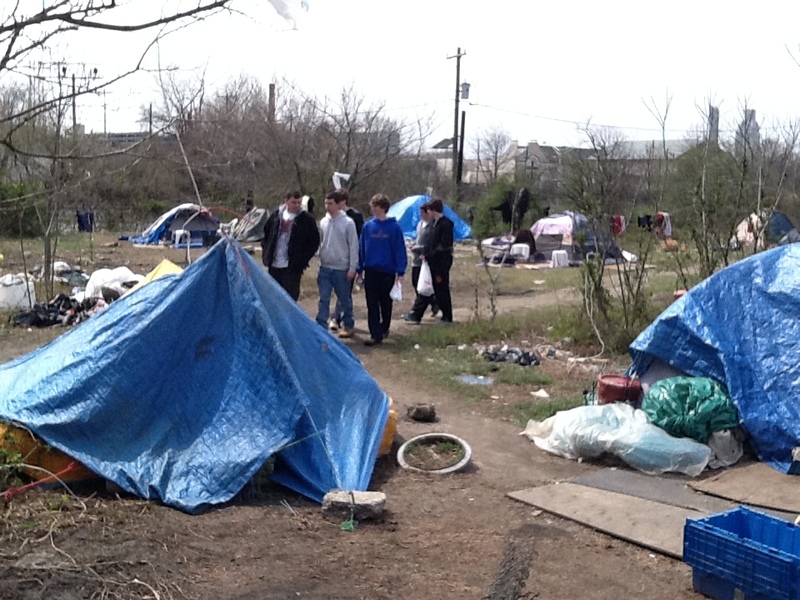 Tent cities like this one have popped up across New Jersey for the state’s homeless. A majority of people identified as homeless were staying in emergency shelters or transitional housing, but 38 percent were unsheltered, living on the streets, or in cars, abandoned buildings, or other places not intended for human habitation, it said. Many sit with outstretched arms outside subway stations or strum away on guitars drawing attention to their plight as sympathetic onlookers drop money into an open guitar cover. More than 48 million people were living in poverty – with a household income of less than $23,550 for a family of four – in 2011, almost five percent more than in the previous year, with median household income decreasing nationally by 1.3 percent from $51,144 to $50,502. With job losses after the worst recession in decades increasing the national poverty rate from 15.3 percent to 15.9 percent in 2011, the Obama administration has this year announced grants totalling $1.557 billion for over 7,750 local homeless housing and service programmes. These are part of Obama’s Strategic Plan to Prevent and End Homelessness announced in 2010 to put the country on a path to end chronic homelessness by 2015 and to end homelessness among children, family, and youth by 2020. Meanwhile, in New Jersey, home to a large number of Indian Americans, tent cities have popped up across the state, including Essex County, which has the largest population of homeless people in the state and its poorest city, Camden, according to My9NJ.com. The Camden tent city that has sprung up “under an overpass, through woods and down with a path of trash” says the local channel is “inhabited by an array of people: addicts, people who have fallen on hard times and some with mental illness”. Legislators in Hawaii, the state of Obama’s birth, last month voted to allocate $100,000 to offer one-way plane tickets to an estimated 17,000 homeless people under a voluntary pilot “return to home” programme, according to the Honolulu Civil Beat. Run by the state’s Department of Human Services, it will set aside seats on airplanes – and possibly cruise ships for participants who must complete a background check, be mentally sound, and have what the bill calls “sufficient personal hygiene”. New York City, Baton Rouge and San Francisco have all tried similar programmes, according to Time magazine. New York City implemented its version in 2007, flying more than 550 homeless people back to their families in places like Paris, Orlando, and San Juan (the most popular destination), it said citing a 2009 article in the New York Times. In June, city council of Baton Rouge, the capital city of Indian-American governor Bobby Jindal’s home state of Louisiana, approved a plan to provide free bus rides to eligible homeless people, Time said citing Think Progress. Its original name was “Clean Sweep”, but to avoid comparing people living on the street to bags of garbage, the programme has been renamed “HOPE” for “Homeless Outreach Prevention Efforts”, it said citing local newspaper the Advocate.